I’m a child of the 80s, born in 1975, and I can still remember some of the great music from the era. Much of it made an impact on my heart and soul as I listened while cruising around the roller skating rink on Saturday afternoons. One song—“Celebration” by Kool & the Gang—I’ll never forget. When that song played, all the roller skaters picked up their speed, as the kids playing video games in the snack bar hurried onto the rink. It was the idea behind it. We all love celebrating. And for good reason. 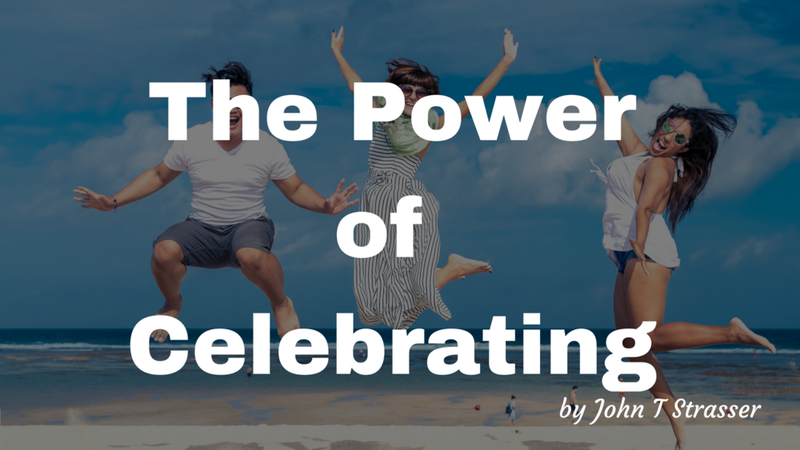 Celebrating is a powerful habit to develop, and it’s something I encourage my coaching clients to do as much as possible. 1. When you celebrate, you instantly change your emotional state. You simply feel better, and life is about feeling. The quality of your life is the quality of the emotions you consistently experience. 2. When you celebrate, you focus on what you’re grateful for in the present moment. And since whatever you continue to focus on will continue to show up in your life—this is the Law of the Universe—by focusing on what you’re grateful for, you will continue to experience things that make you grateful. 3. When you celebrate, you connect with the vibration of celebration—a higher vibration, which causes you to attract into your life more of the objects, the people, and the experiences you desire. 4. And when you celebrate, you literally rewire your brain. Think of your brain as a giant, connected power grid, with billions of neural pathways lighting up every time you think, feel, or do something. Some of the pathways are well established—these are your habits. Every time you continue to think or feel a particular way or take a particular action, you strengthen the pathways and create a highway—so that next time the same kind of thinking, feeling, or doing becomes easier—you get there faster. When, however, you begin to think, feel, or do something differently than before, you create a new neural pathway. And while this pathway is not well established yet—it’s a dirt road at this point—as you continue in the same way, the pathway strengthens, while the old pathways weaken. This is the process of rewiring your brain, which scientists call Neuroplasticity. Essentially it means you have the power to recondition yourself to think, feel, and act in the way you choose. When you get up early in the morning without hitting the snooze button, celebrate it. When you eat healthy all day or refrain from making a negative comment after your mind tries to get you to do so, celebrate. Celebrate every single thing no matter how significant or insignificant. It’s just like when a child writes his or her name for the first time—we celebrate it, no matter how poorly it’s written. Continue to celebrate as much as possible, and your life will continue to get better and better!